Input text: There is a very long first wall. On the right of the first wall is a second very long wall. The second wall is 10 feet away from the first wall. The first wall faces the second wall. The second wall faces the first wall. The first wall is [texture]. The second wall is [texture]. 4 feet On the right of the first wall is a blue tricycle. On the tricycle is a small boy. The boy is 7 inch in the tricycle. The ground is [texture]. 37 feet in front of the boy is a third wall. The third wall is on the ground. The third wall is texture. 0 feet behind the third wall is a door. Behind the door is a first [texture] person. The first person is 5 feet tall. The first person faces the boy. 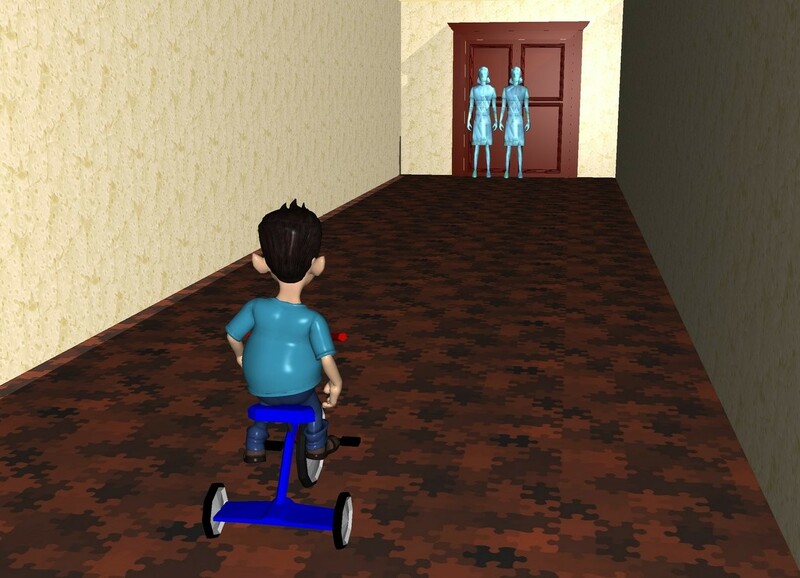 On the right of the first person is a second [texture] person.The second person faces the boy. The second person is 5 feet tall.